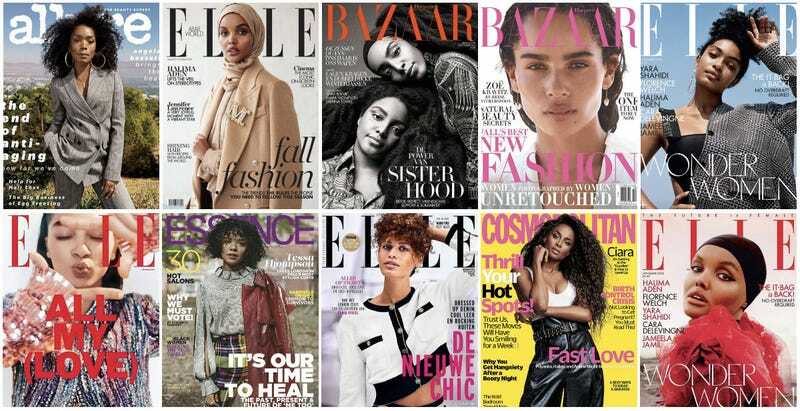 (Clockwise from top left: Angela Bassett on Nov. Allure; Halima Aden on Oct. Elle Middle East; TK Wonder (l) and Cipriana Quann on Nov. Harper’s Bazaar Nederland; Zoe Kravitz on Oct. Harper’s Bazaar; Yara Shahidi on Nov. Elle UK; Halima Aden on Nov. Elle UK; Ciara on Nov. Cosmopolitan; Mila van der Horst on. Nov. Elle Netherlands; Tessa Thompson on Nov. Essence; Raven Lyn on Oct. Elle Mexico. It wasn’t just a phase. After years of being relegated to the inner pages and being told that covers featuring black women don’t sell, the fashion industry finally seems to be taking the plunge into parity, featuring more and more black women on its covers. In the past week alone, we’ve featured Kerry Washington covering Marie Claire, Nicki Minaj on Harper’s Bazaar Vietnam and Cardi B on W’s Art Issue (shot by fellow black female phenom, Mickalene Thomas). But as the leaves continue to drop this autumn, so do new covers celebrating black beauty, in all its diverse glory. Clockwise from top left: Shonda Rhimes, (l-r) Danai Gurira, Lupita Nyong’o and Angela Bassett, Yara Shahidi, all on Nov. Elle; Lena Waithe, Tiffany Haddish and Regina King on Variety Magazine. Five of the nine women featured on Elle’s 25th annual Women in Hollywood issue this November are black, as are three of the five on Variety’s “Power of Women” covers—including out and proud icon Lena Waithe. All prove that our impact has become undeniable (pdf)—in the box office, retail sector and beyond. But what does this really mean for us, collectively? It means that if we want to keep seeing ourselves elevated in the same measure and proportion that our white counterparts have been for decades (okay, centuries), we need to keep supporting, whenever and wherever we see ourselves. While admittedly, the need to support and elevate a “for us, by us” culture looms large, this writer would argue that the two aren’t mutually exclusive; we can both support and lobby for our rightful place in mainstream culture, and continue to develop and support enterprises, platforms and media that center and support us (you know, like The Root). In other words: Keep buying, supporting and demanding representation. Because it matters.